combination of slow weight exercises and dynamic motions ! simple design allows a number of exercises ! In contrast to the isolated machine workout, many supporting muscles of the body are trained during the workout with kettlebells. The muscles of the forearm is always strengthened thanks to the thick grip ! easy to transport- ideal for carrying en route ! 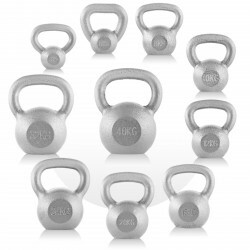 Kettlebells are cast-iron balls with fixed handles. Using those special training weights, you can strengthen your complete body. It is made possible because not only one muscle is trained during the workout with the round weights but many supporting muscles are strengthened at the same time. Kettlebells offer a number of exercises: Strengthen your arm muscles with biceps-curls, your shoulder muscles with lateral/front lifting, use the Kettlebells as additional weights for your abdominal workout (crunches) or for playful, special-dynamic exercises. Kettlebells become more and more popular. The innovative dumbbells are more often used for courses at fitness centres as well as at home ! Sport-Tiedje Kettlebell exercise poster In stock!